Mary's Turkeys is our largest producer. They have been adding outlets so fast we can't keep up. For a current list of Mary's Turkeys' retailers, see www.MarysTurkeys.com. Reese Turkeys in Kansas is also selling in California this year. See www.ReeseTurkeys.com. Some Costco stores in California will carry heritage turkeys from Reese Turkeys (Good Shepherd Ranch.) See http://www.costco.com. Sylvia Mavalwalla, ** Reserve early for 2006. Peter Schaner, ** Reserve early for 2006. We don’t like to be negative, but watch out for turkeys advertised as Heritage breeds which aren’t. 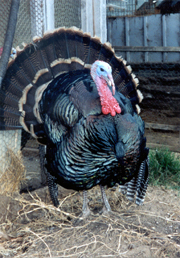 Diestel Turkey ranch is raising an older breed called the Orlop strain of Broad-Breasted Bronze turkey. This is the predecessor of the Broad Breasted White. It’s essentially a white, but with brown feathers. These turkeys were developed by Orlop Turkeys and others in the 1930’s. They can’t mate naturally. They do not mature like true Heritage Turkeys and they don’t taste as good. Diestel is by far the largest independent turkey producer in Northern California. The Director of Slow Food USA and I approached them in 2002 to raise real Heritage Turkeys but they went in their own direction instead. Diestel is now marketing these turkeys as heirloom turkeys. The fact remains that they can be raised faster, with less feed, and they can therefore be sold cheaper, to drive genuine heritage turkeys out of the marketplace.